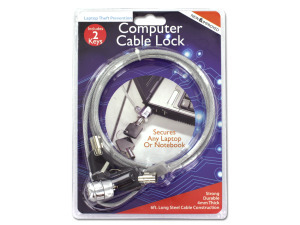 Secure your laptop or notebook with this Computer Cable Lock featuring strong, durable steel cable construction with a durable plastic covering and metal lock. Cable is 6' long and 4mm thick. Secures any laptop or notebook. Includes 2 keys. Comes packaged in a blister pack. 4 pcs. 8 pcs. 12 pcs. 16 pcs. 20 pcs.